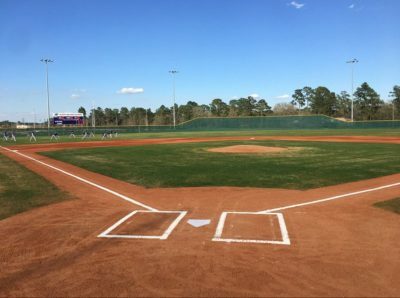 The Klein Cain baseball field. Baseball athletes spend a lot of their time practicing in this field to skillfully prepare. Photo courtesy of the @KCainBaseball Twitter. Patin Participates has been an ongoing segment hosted by Cain Live since early November 2018. In each segment, Nicole Patin gets a chance to be involved in the student body through various activities. On March 7, 2019, Patin got the chance to connect with the baseball team, and throw the very first pitch of the game. While the first pitch is an old baseball pastime to honor the guest, the tradition is still relevant today. Moreover, for the first time in Klein Cain history, Patin was able to participate in this ritual. While the crowd roared tenaciously, Patin took her place on the field and tossed the baseball. Though this monumental moment happened quickly according to some, Patin described the moment as honorable. While the game resulted in a loss for the team, the athletes remained faithful to their season.